Last week’s blog article No Time For Exercise? Here Are 7 Solutions! was all about finding time in your day to exercise. Carrying that over to this week, here are some sneaky ways to work in movement and exercise during your day…. Walk just a little further on your daily walk(s). Walk past two more houses/telephone poles/blocks/or track laps than normal. You won’t even notice the time or effort it takes to do it but it all adds up. Walking 0.25 miles more on your walk each day adds up to an extra 90 miles in a year. That’s kind of a big deal! Ruck! Rucking is part of Special Forces training and we can borrow from it…throw on a backpack with a bit of weight inside and wear it on your daily walks for an extra challenge. There are special rucksacks and ruck weights (flat plates that slide inside) but you can use any sturdy backpack and put anything in it…bricks, textbooks, even a few big water bottles. Start low, just 5 or 10 lbs for a few weeks, until you get used to it and increase by a few more lbs until you’re able to carry 20 or 30 lbs (or even more). Sure, your neighbors will probably think you’re weird…mine definitely do…it’s totally okay! Every time you wash your hands do 5 exercise reps. Remember when I talked about adding a new habit to an existing one? You can do that in little ways too. Think about how many times a day you wash your hands…do a few squats (or lunges or jumping jacks) every time and you’ll get like 30+ exercises done in a day! Or pick any habit…every time you check Facebook perhaps (although that might be too much!). Play a classic drinking game. Got your attention didn’t I? Okay, so no drinking…instead of taking a shot every time you hear a certain word, do 5 reps of an exercise! This is similar to Sneaky Way #3 but pick a word instead of a habit. For example, every time anyone says (yourself included) your boss’ name, the company name, or a common industry buzz word/phrase, do 5 squats. Get your coworkers in on it too! Get up when you’re on the phone. Take phone calls standing up instead of sitting at your desk. Or, if you’re on your cell, take a walk down the hall or around the building while you’re talking. Take a quick break. Taking a quick 10-minute (or even 5-minute!) break to move will help you be more efficient, productive, focused, alert, and boost your mood. You’ll feel less fatigued, stressed, anxious, irritable, overwhelmed, and frantic. Even though it feels like you don’t have 5 minutes to spare….the work you are doing when you’re overwhelmed and stressed is going to take longer than when you are refreshed, alert, and focused. If for no other reason but for the sake of improving efficiency at work…take a break and move! 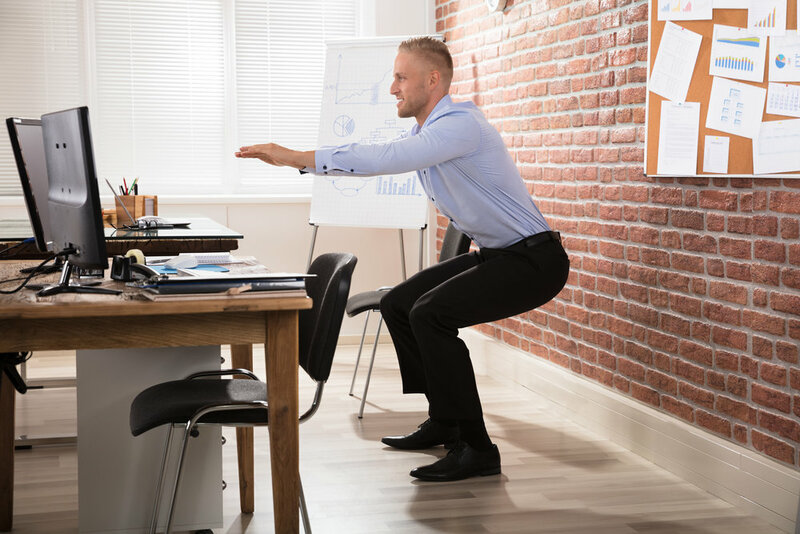 Download a Free 10-Minute Office Workout Routine! Move while watching tv. As I mentioned last week, the average person watches upwards of 4 hours a day of tv every day. One option is to cut back on tv-time and swap it out for something else like exercise…or if you just need to chill-out try meditating, gentle yoga, reading, playing a game with your family (my husband and I love playing cribbage), or a relaxing hobby (like coloring!). You could also try doing a little living room workout while you’re binge-watching Netflix. I bet you’ll sleep better too! Have a spontaneous dance party. Throw on your favorite music and shake your booty!! Get your family to join in. It feels so good to move to music…it releases tension, makes you smile from the inside out, and is fun and freeing…it also gets your heart-rate up, bonus! Now get up from your computer and move around! You’ll love how it feels! Remember, you can break up your exercise time into multiple chunks. You don’t have to spend an hour at the gym every day. Get it in when you can, hey! 5 squats here or there might seem like nothing but it ALL ADDS UP! Do 5 squats a few times a day and you’re looking at 75 squats during a 5-day work-week. And that’s not nothing! Your privacy will be respected. No spam…promise!